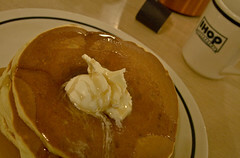 Tomorrow is Free Pancake Day at area IHOPs. Well, sorta. IHOP has partnered locally with the Leukemia and Lymphona Society to help raise funds for the organization, and will give out free short stacks of pancakes, with the *wink wink nudge nudge* expectation that you drop some cash in the box for LLS. Both DC locations (DCUSA & Alabama Ave) will be participating, so drop in for some delicious pancakes, and know that your donations will be used for fighting cancer that affects a broad spectrum of Americans.